What's the role of Puerto de la Cruz with Tenerife exhibitions? 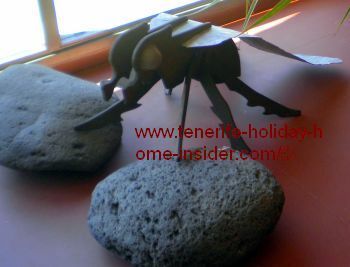 Puerto de la Cruz with its novelty Tenerife exhibitions remains an art cradle of international scope. 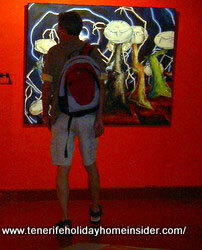 El Puerto Cruz has had several galleries and art centers up to now. However, none did enough for the International community of all ages. Those three have most innovative art impact. The latest of Tenerife exhibitions from 2011 to 2016 by Manufactum in Puerto de la Cruz keep on promising more novelties for the art world. Indeed, the Manufactum gallery of the oldest Tenerife resort spreads so many good vibes which are needed today. Its exhibitions show so much new, innovate and sensational arts and crafts that it is an absolute highlight during our recent difficult times of Recession since the USA Lehman brothers investment banking collapse in New York. Browse the Manufactum's versatile gixart.com tattoo business with many visible archives of tattoo designs to find the most exotic ones. They go from Japanese art to the most simple symbolic or tribal images. Their demand grows every day. Its owner and top Italian designer Guliano Montisci hasn't only studied the history of tattoos. He is one of best Italian painters of the new Millenium. You will also agree when you admire his Japanese Sumi-e creations and all his other art. Contemplate contemporary art Guliano Montisci paintings with cubism art, surrealism and more, as does César F. Real Real who is depicted in front of such striking work. You may be lucky to meet the charming manageress for the Tenerife Manufactum when you visit the gallery. She deals with public relations and other aspects of the art shop. She also helps with the exhibits and the marketing of Manufactum whose Tattoo studio is one of most inspiring in Europe. Therefore, the Manufactum Gallery which displays and sells arts and crafts made by hand is here to stay. Friends, fans and members also contribute to this. However, some of the art displayed is bound to change. 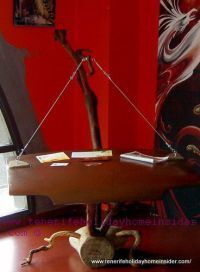 This contemporary art center caters for best international artists of photography, fine art, modern art, wooden sculptures, designer jewelry, interior design for luxury VIP living, extremely unusual suspended gallery furniture, designer ware in the form of office, garden and home appliances, such as lamps, ornaments and exclusive gadgets for villas and apartments. Hurry, spoil yourself with a late Christmas gift, such as a fantastic lamp from Manufactum for your holiday home in Tenerife. Give it the artistic touch, unless you want that something exclusive for a special friend or business acquaintance. Of course, Manufactum Tenerife exhibitions has jewelry which may fit the latest fashion of Spain. 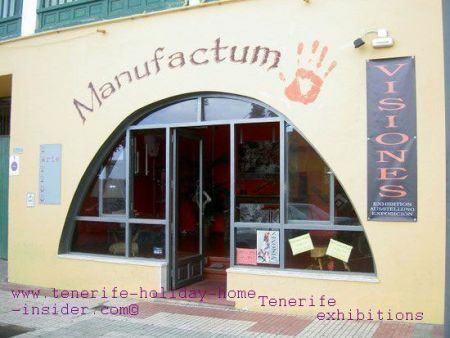 Again, the last Christmas sale of 2015 by the popular Tenerife exhibitions by Manufactum lasted for several weeks. The elegant La Mosca metal sculpture is just one of several new works by Giuliano Montisci. 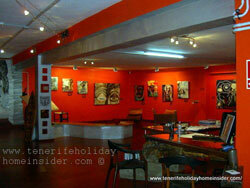 Several paintings have been added on the gallery walls, some of which are also from new artists in Tenerife. Of course, there are also new tattoo designs by the master. Artistic creativity and evolution at Manufactum never stops. There was a delightful permanent art shop exhibition with incredibly cheap art. Perhaps made in China, as commented by an artist friend of mine... It was on offer next to the Martianez Mall. Much of it looked like original oil paintings from far. This place called Caleton de Cabras Gallery Gallery Calzada de Cabras (goats) Martianez or Gallery Calletón is also mentioned at Puerto de la Cruz culture. Exquisite jewellery or jewelry was exhibited and sold there, too. A relevant photo represents the humor of its owners. Unfortunately, the Martianez Calzada exhibitions in the gallery shop and the hilarious mural were gone by the end of 2011. The same must be said about the Tenerife exhibitions at the still existing restaurant Palmeras Arte. Unfortunately history now. There is nobody at the moment who has the know-how, or time and energy to revive the art Vernissages and exhibits since the owner and famous Catalan cook of Palmeras Arte Restaurant passed away, suddenly. The Magda Rivera Gallery of Puerto de la Cruz has been closed. Her exhibitions at the 4star Hotel Concordia Playa have also stopped after a hotel renovation. She is only exhibiting in Mainland Spain now, to the best of my knowledge. The shop Arte y Diseño Garachico of www.artegarachico.com has closed its doors as reported in the context of Garachico art and crafts shopping information. In the past, this shop gallery also exhibited some of the fine art and collage aquarels by the individualistic artist Anand Rubai who lives by Puerto de la Cruz. Of course, there are some excellent and easy to find, rewarding top Santa Cruz museums on Tenerife with special as well as permanent exhibitions. Most are located within a radius of about half an hour's walk or drive, such as the Museum of Science and Cosmos La Laguna in relation to the capital. A few exhibitions are in other towns of the island. Now, this financial institution is strong in auctions called subastas, such as for an expensive jewelry shop in January 2012. Its cultural seat in Tenerife is still at Plaza del Patriotismo, 1 of 38002 Santa Cruz de Tenerife - Sala de exposiciones(exhibition hall). Arteinformado.com listed Espacio cultural Santa Cruz de Tenerife Caja Canarias art events in Spanish. There are occasional exhibits at the castle San Felipe El Castillo Puerto de la Cruz but, most are not totally free any more, although a Vernissage with included food and drink may be an incentive. The superb portray and caricature painter Julio Puente doesn't hold permanent Tenerife art shows. However, watch his skills on most days when he portrays live models, i.e. tourists or locals in front of Lago Lido Martianez, as previously mentioned by Tenerife art shopping by the Tenerife holiday home insider. By the way, the Lido Martianez Tenerife exhibits permanently most stunning art, like the Cesar Manrique sculpture which is depicted beside. 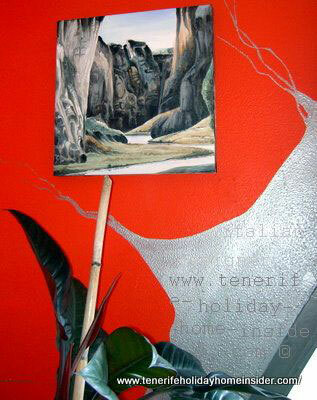 From Tenerife exhibitions back to Spain art. Stay posted about exhibitions by Facebook of sculptures by Julio Nieto shows the man from La Orotava whose street art is found in all major Tenerife cities.